Importance of Confidence. When confidence evaporates in an economy it can have a knock on effect. Low consumer confidence will soon create low business confidence and there is a danger we can 'talk ourselves into recession'. 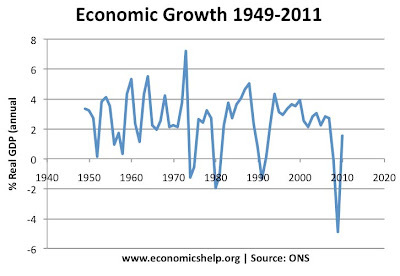 Because we expect a negative growth, we save, avoid spending and this can easily cause this fall in economic growth. Multiplier Effect. This states the a decline in injections causes a bigger final fall in GDP. For example, if one firm closes down, it will have knock on effects. The unemployed workers will spend less causing other firms to experience lower sales and this leads to further job losses. 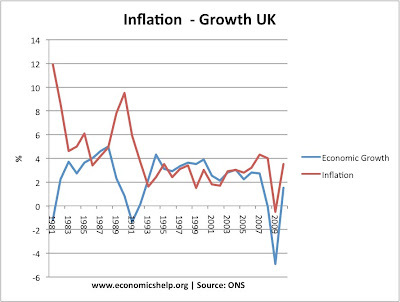 Inflation v Economic Growth trade off. In the 60s, 70s and 80s, there appeared to be a simple trade off between growth and inflation. In a boom period, we would get high growth and high inflation. But, then politicians would worry inflation was too high. To reduce inflation, interest rates would be increased causing a fall in spending and a recession. This was certainly the case in the Lawson boom of 1980s and subsequent recession. Asset Prices. Asset prices often follow the business cycle. High growth leads to rising asset prices which strengthen the boom and then when the economic cycle turns, it leads to falling asset prices which lead to a negative wealth effect and lower spending. Falling asset prices can make a recession last for a longer time. Bank Lending. In a recession and period of falling asset prices, banks will face an increase in bad loans leading to financial losses. The deterioration in their balance sheets will lead to a decline in credit availability. A 'balance sheet recession' is often the most prolonged because if banks cut bank on lending (e.g. 2009 recession) then business are starved of loans and consumers find it difficult to get credit. Unexpected Events. Sometimes recessions are caused by unexpected events. 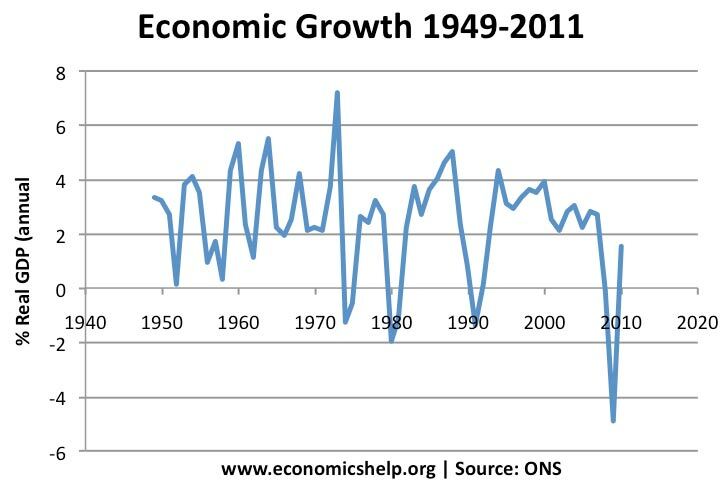 Certainly the oil price shock of 1973-74 was instrumental in causing a fall in spending. (Note for A Level students, it causes aggregate supply to shift to left, rather than shift in AD) The Financial crisis of 2007-08 was another example of an unexpected shock. Inventory Issues. Some big ticket items are bought over a period of 10 years. If there is a mild turn down in the economy, these luxury items will not be bought. People will delay purchasing them. This contributes to bigger downturn.